"Massive stone" of emerald .. The value can not be estimated ! In a happy surprise, and very profitable of course, a worker in the largest mine of its kind in the world, found a giant and rare stone of emeralds, weighing more than 1.1 kg. 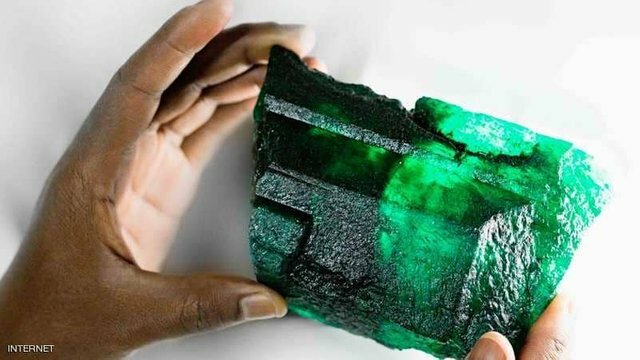 A 5655-carat stone was found earlier this month at the Kagem Emerald Mine in Zambia and was to be auctioned for sale in Singapore in November, Gimpels Group Ltd. said in a statement on Monday. The size of the new stone is about double the size of the largest stone similar to that precious material, and was found more than a century ago, in 1905 near Pretoria in South Africa, and called it the name "Cullinan." The enormous value of the stone found in Zambia is difficult to estimate given its weight and its scarcity, according to Bloomberg.